"You made it a pleasant experience for us and gave us hope that would improve Bob's difficulty with his eyes. God bless you for your kindness to us." L.D. 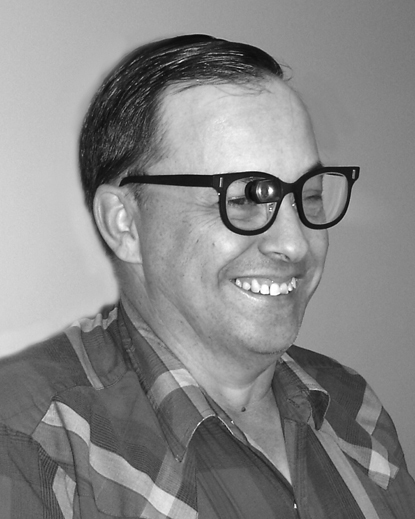 "I really enjoy my low vision glasses"
Manokel Hinshaw traveled from West Virginia seeking help from Dr. Armstrong. She has been diagnosed with wet macular degeneration and is receiving treatment from her ophthalmologist. Mrs. Hinshaw requested Dr. Armstrong's help for driving, reading and using her computer. She told Dr. Armstrong "It is very difficult to write or print". In addition to her eyeglasses Mrs. Hinshaw was using two hand magnifiers to help her read. Because they are awkward to use she was hoping that glasses could be prescribed allowing her to have both hands free. By thoroughly evaluating her remaining vision Dr. Armstrong was able to help her with bioptic telescopic glasses for distance vision and wide angle telescopic glasses which she can use for both reading and computer. 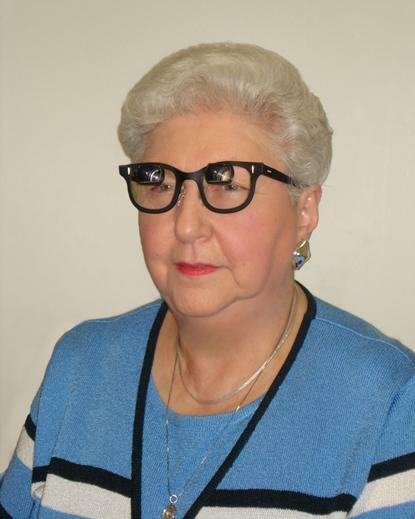 When Dr. Armstrong called her a few weeks after she received the low vision glasses she told him that "I really enjoy my low vision glasses. Dr. Joseph C. Smiddy, Chancellor Emeritus, of the University of Virginia’s College at Wise has had macular degeneration for 25 years. He came to Dr. Armstrong asking for help with reading, TV and watching sports. 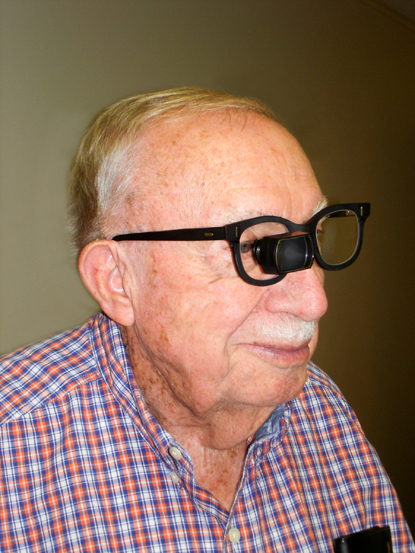 After a thorough low vision evaluation, Dr. Armstrong prescribed bioptic telescopic glasses for distance use and telemicroscopic glasses for reading and other close tasks. "Dr. Armstrong helped my brother also........he is a wonderful "eye doctor". I would recommend him to anyone with severe vision problems. He is honest and tells you up front if he thinks he can help you or not. He does not give you false hopes. I was very impressed with the examinations he performed on my brother, the time he took to make sure everything was accurate, and the help my brother received." D.M. “I Can See Clearly Now, The Rain Is Gone"
Clarisa Shepherd has a ministry of song. She loves to sing in her church to praise the Lord. She has had reduced vision since birth due to optic atrophy, an optic nerve disease. She sees lights only with her right eye. 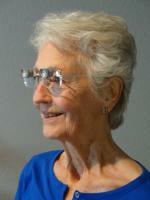 When she came to Dr. Armstrong Clarisa was using prismatic glasses prescribed by her previous eye doctor. They allowed her to read but required her to hold her book or music just a few inches from her face. She asked if there were glasses that would allow her to hold her music lower and farther from her face so her voice would project better and she could see the people she was singing to. The previous doctor had considered putting a small telescope in her glasses to allow for better distance vision. Clarisa was unable to use those because her eyes are in constant motion, a condition called nystagmus. The telescope was so small that she was unable to keep looking through it. 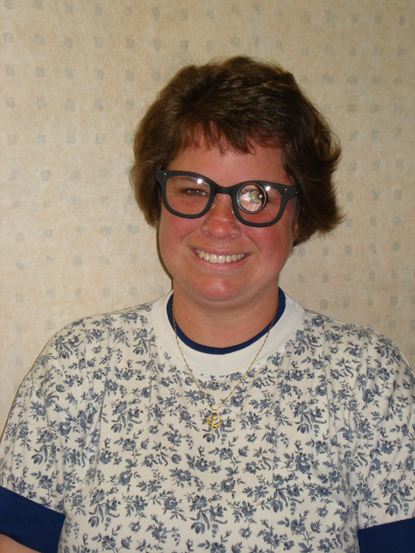 After evaluating Clarisa's vision with various low vision devices Dr. Armstrong prescribed a wide angle telescope mounted in the left lens of her glasses. The wide angle telescope gives her improved distance vision. She has worn the telescope at plays and is able to see the actors and follow the action on stage. Two accessory lenses were prescribed which she can add to the telescopic lens. One allows her to hold her music farther away and below eye level. The other helps her read the screen of her computer. "Thank you very much for the glasses. What a difference they make." Clarisa is enthusiastic about her new low vision glasses. "I love my new glasses. I can see the music and also the audience. I can stand back with the rest of the group and still read the music. Reading is much better and my husband says that I am reading out loud much faster than before." Diane Crow suffered a serious vision loss from stroke of the optic nerve. She was unable to do many things that were important to her. 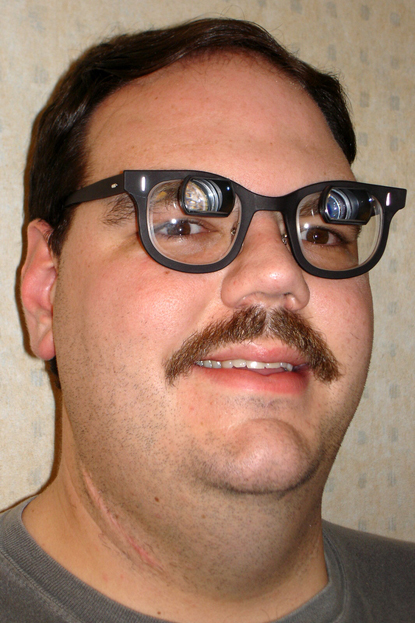 Dr. Armstrong prescribed telescopic glasses for distance vision with accessory lens caps for near vision. 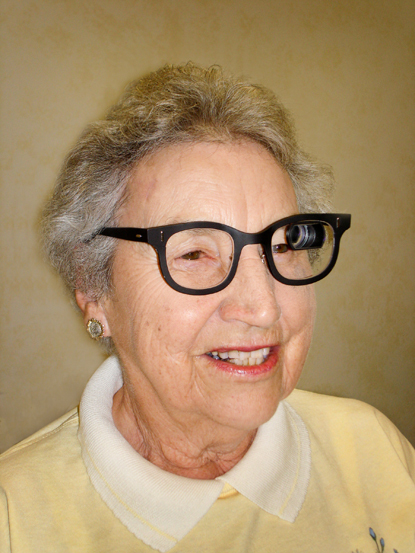 After receiving the low vision glasses, Diane Crow wrote telling of her experiences. "Beautiful. And you have a beautiful heart too, Dr. Armstrong. Thank you for caring so much about low-vision sufferers! I so appreciate what you did for my brother." D.M.L. Laura Stanley has macular degeneration. She asked Dr. Armstrong for help reading, watching television and with her distance vision so she can keep driving. Dr. Armstrong prescribed bioptic telescopic glasses for driving and a pair for TV and reading. Due to hemorrhages within her eyes Margot Templeton could not pass the Virginia driver’s vision test and had lost her driver’s permit. She came to Dr. Armstrong hoping to be able to drive again. She also asked for help with reading which had become very difficult for her. 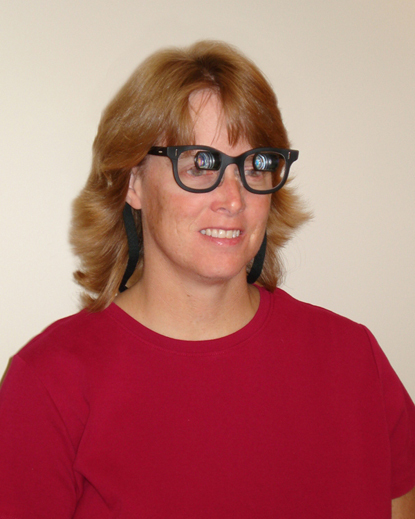 Michelle Pevarnik suffered a severe vision loss at age 27 as a result of Stevens-Johnson Syndrome. The West Virginian came to Dr. David L. Armstrong seeking help. Michelle had not driven in 12 years and was no longer able to play the piano. She could not read the music. After a thorough low vision evaluation Dr. Armstrong prescribed bioptic telescopic glasses for Michelle to help with her distance vision. A small lens can be added to the telescopic glasses allowing her see the piano music. Michelle plans to drive again now that West Virginia, like Virginia, allows people to be licensed to drive while wearing bioptic telescopic glasses. Michael Callison has had low vision since birth. Over the years the West Virginian has been seen yearly by several doctors in the same eye care practice. They all told him that no help was available. Michael came to Dr. Armstrong asking for help when reading, using his computer and for his work, small engine repair. He also hoped for improvement seeing at a distance. Dr. Armstrong determined that Michael’s vision could be helped for all of those things. Glasses with a telemicroscope were prescribed for reading and repairing engines. For distance use, Dr. Armstrong prescribed telescopic glasses. An additional lens over the telescope allows Michael to see well at the computer. Jarrod Church has had reduced vision since he was an infant. The Southwest Virginia native has been seen by several eye doctors and by the Virginia Department of the Blind and Vision Impaired. He has used a closed circuit reading machine but wanted to be able to read better, use his computer as well as watch sports and television. Jarrod came to Dr. David L. Armstrong requesting help with those activities. Dr. Armstrong prescribed telescopic glasses adapted for reading and computer use and bioptic telescopic glasses to help Jarrod see better at a distance. He uses the second pair for television and to watch sports.